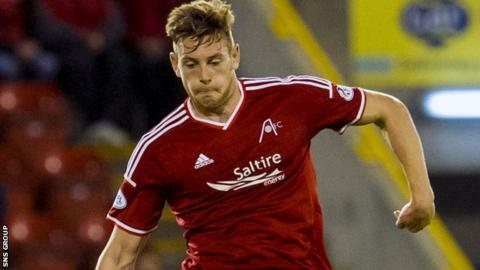 Aberdeen's Ash Taylor is likely to miss the League Cup semi-final against Dundee United on 31 January. The centre-back was substituted due to a knee problem sustained during the 3-3 draw against Dundee on Saturday. The 25-year-old is expected to undergo an operation on Wednesday and could face a month on the sidelines. The former Tranmere player was part of the Dons side that racked up eight consecutive clean-sheets in the league, until the draw on Saturday. Last week, Taylor signed a contract extension keeping him at Pittodrie until 2017. Fellow central defender Russell Anderson, 35, has not played since having knee surgery in September.